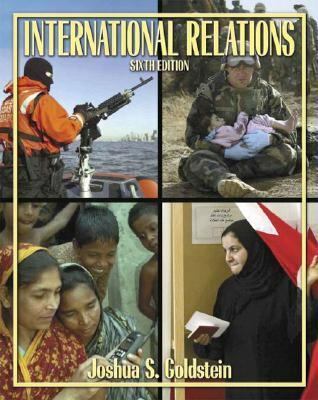 The top-selling text in its field, "International Relations" is acclaimed for offering the most current and comprehensive coverage of international relations theory, international security, international political economy, and global issues. From war, trade, and development to terrorism, human rights, and the environment, this introductory survey examines the relations between states, the international system, and transnational actors and influences. With the broadest discussion of theoretical perspectives, the most up-to-date coverage of international events, and the strongest emphasis on critical thinking, "International Relations" includes all the tools students need to engage the discipline's concepts and to understand what is happening in the world today. Joshua Goldstein and Jon Pevehouse's lively writing, abundant visuals, and seamless integration of learning technology make this text a favorite of instructors and students alike.Goldstein, Joshua S. is the author of 'International Relations', published 2004 under ISBN 9780321209481 and ISBN 0321209486.